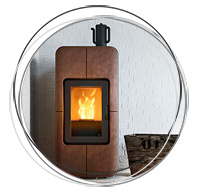 Front closed hydro fireplace with rise and fall door, which can be positioned at a 45° angle or against a wall. The height of the door provides an excellent view of the flames in their entirety. Can be integrated with heat exchanger kit (see accessories).